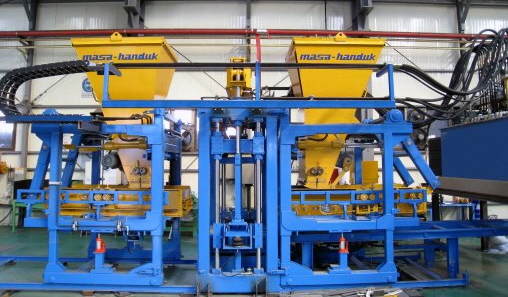 The R 9000 AF block plant imported from MASA AG, Germany is highly sophisticated. All unit processes such as mix proportioning, weigh batching, mixing, casting by vibro compaction, conveying to curing chambers, cubing and palletizing are controlled by modern PLCs and completely automated. This ensures that process accuracy is maintained throughout to achieve precision quality products. A range of process parameters can be used to produce a variety of both lightweight and dense concrete products. Since no manual handling is involved, the products have excellent finish, precise dimensions and high strength.